Laurence Kavanagh‘s first exhibition at Marlborough Contemporary employs a determinedly lo-fi, hand-made aesthetic. Old fashioned collage is central here – conjure the sound of razor-sharp blades slicing through paper – incisions, excisings and graftings dominate in the sculpture as well as the wall-based works. 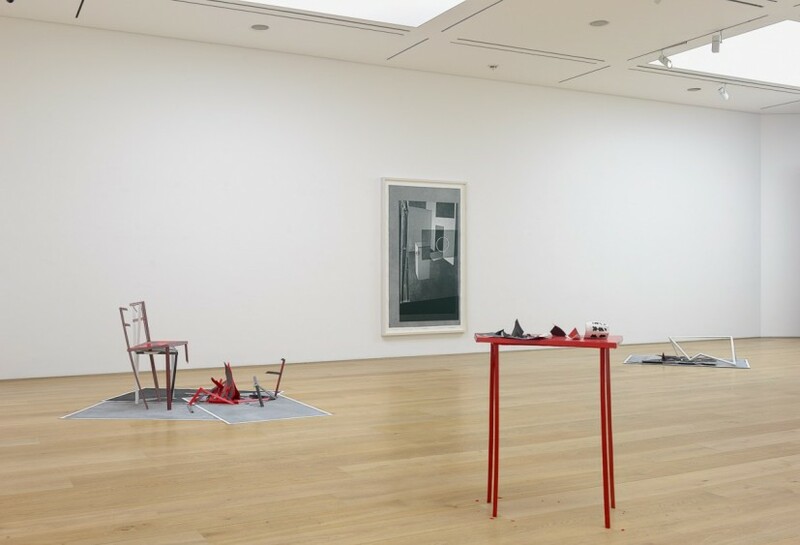 Where the sculpture has a prop-like quality, an anti-heroic sense of performance residue, four of the six framed collages are imposing in size, defying the natural scale of the medium which is normally the hand-held and intimate. The colour red predominates. May (Calendar) offers an alluring play of positive and negative space, with a trompe l’oeil effect framing device that is in fact a red cord, pinned directly to the wall. The work incorporates multiple cut and layered collage elements and where the tasteful countryside view would be in a real calendar, a male face peers between luscious gestural swathes of red gloss paint, adding up to a sophisticated formalist game of hide and seek. Kavanagh has an abiding fixation with cinematic visual language which, with its cuts, cross-fades and splices shares many of the strategies associated with collage. Cinema also connects him to artists of other generations such as John Stezaker and before that Richard Hamilton. The three large-scale collages (134 x 222cm) borrow their format from the aspect ratio of widescreen cinema, as well as repeatedly riffing on the motif of curtains that alternately conceal and reveal. As a student in the 1990s Kavanagh trained in Newcastle, where Victor Pasmore and Richard Hamilton spent years as highly influential teachers through the 1950s and 60s respectively. A connection to both artists work is discernible in this current exhibition; some of you may have seen the group of Pasmore reliefs and paintings that Kavanagh curated for Marlborough Fine Art at Frieze Masters last year. 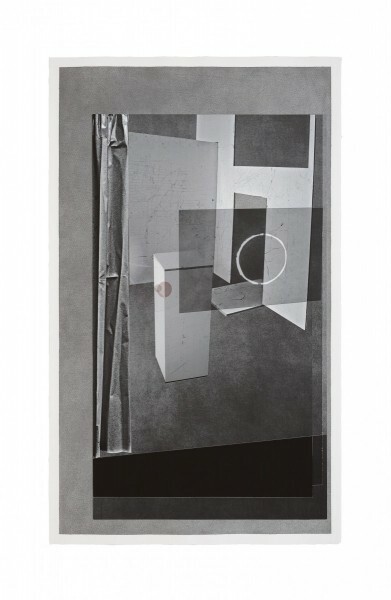 The most recent work in the current exhibition May (Impossibly Now) employs geometric and spatial tactics that recall Pasmore reliefs from the 1950s, but also Richard Hamilton’s 1957 installation An Exhibit, which was recreated in February this year at the ICA in London. The image of a drinking glass recurs repeatedly throughout the show, variously spilling, shattered or even containing a small fire. Where many works incorporate found elements such as bible paper, or airmail envelopes (who knew you could still find those?) the glass is always a constructed object, standing for a plot device, a signifier for the absent human. Also recurring through the May series is the image, often highly abstracted, of an eclipse. The movement of the heavens connects to the theme of the calendar and the passage of time, one star cutting across another, like collage technique itself, simultaneously unifying and destabilising the image. This is complex and accomplished work that holds many ideas in delicate suspension. 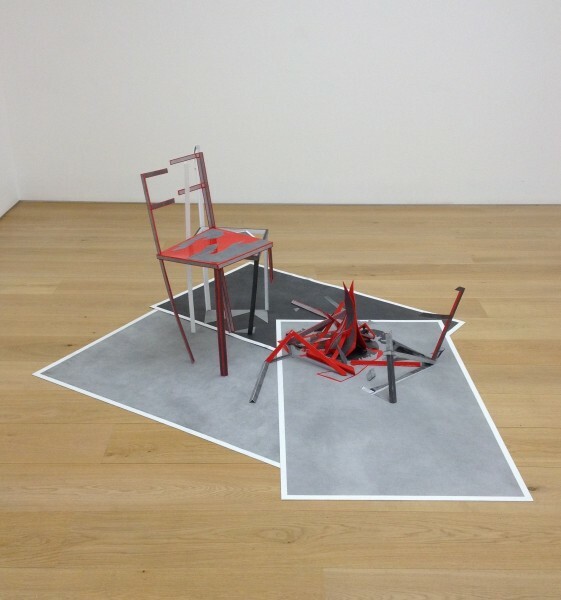 Kavanagh has had numerous accolades, from a Rome scholarship to a residency at the V&A, but this should be the show that makes people sit up and take notice.